This is the second of the projects I worked on over the Thanksgiving break. 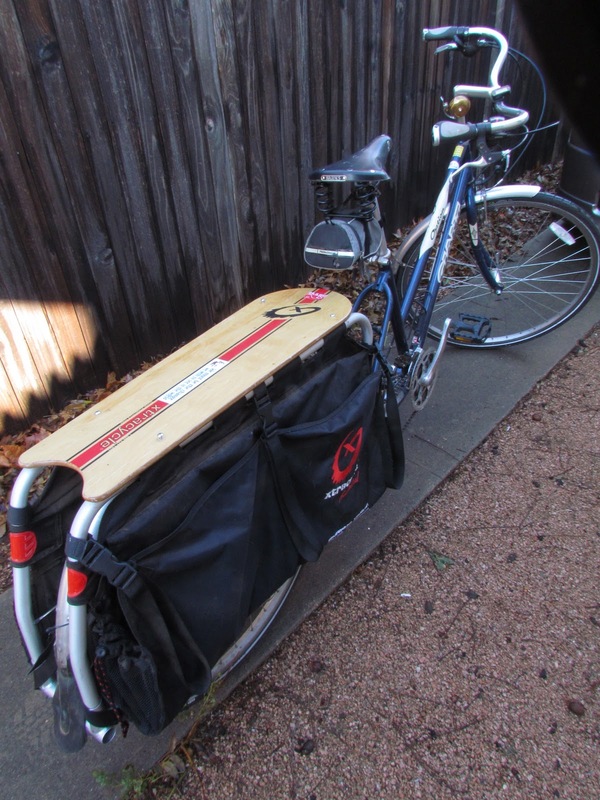 The snap deck that came with my Xtracycle Free Radical was a simple piece of plywood. Naturally, since it is plywood, the finish doesn't hold up well to weather. In fact, the instructions say not to leave it out in the rain. What kind of utility bicycle never gets left out in the rain? So I decided to put my paddle-making skills to work and create a weather-proof wood deck out of some scrap black walnut and soft maple. After all, nobody ever said you couldn't take a canoe paddle out into the rain. You can't tell from the photos, but the maple has some very pretty curl in it. I finished the deck with four coats of marine polyurethane. Beautiful! Far superior to the original. I just don't understand how you do stuff like this. That is pretty snazzy! You really should live in Salida; your bike collection would fit in well here. I saw someone ride by today with his skis strapped to his Xtracycle (in summer, it's usually kayaks). Litter Patrol--Sorry, I don't sell my work.